Enjoy Panoramic Views of Pinehurst at the golf-front Three Green Retreat! Three Green Retreat offers an ideal location on Briarwood Circle and rests beside the Par 3, 16th tee. 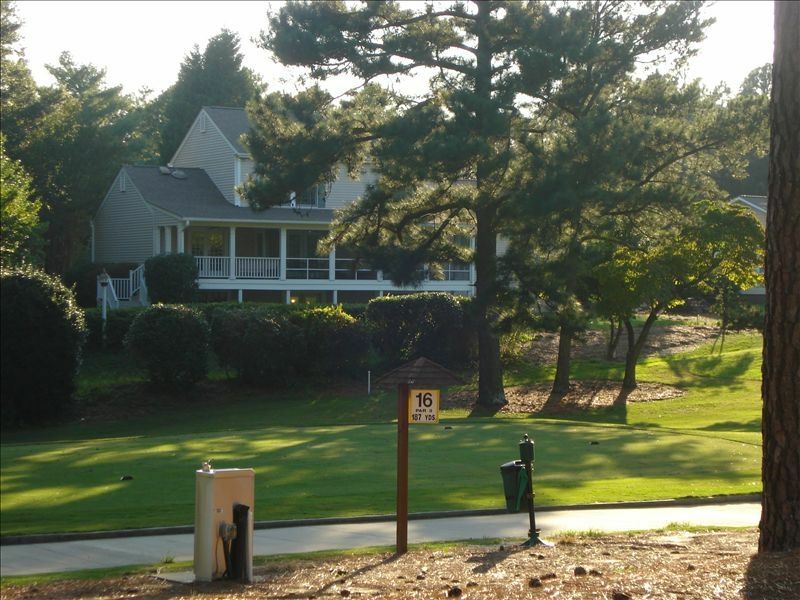 Situated close-by to the Pinehurst clubhouse, take the short walk up through the 18th fairway. At the house, enjoy plenty of space, a billiards room, WIFI, HDTVs throughout, a private backyard, and an outdoor Jacuzzi. Furniture, beds as well as all linens are provided. For Wedding Parties, you'll be pleased with the extra large mirrors in each bedroom! For those unfamiliar with the Pinehurst area, please understand that only courses #1- #5 play to/from the legendary Pinehurst Country Club. The beautiful #6 - #8 are located in nearby residential areas. It's a tough itinerary; we hope you're up to it. Don't overdo it --you just may have to repeat this routine again tomorrow. Cleaning is performed by a professional cleaning company. Also, all linens are cleaned off-site for highest sanitation. We live in CT and play golf regularly at a wonderful old (1917) Willie Park JR designed course. After making a few trips to Pinehurst for the annual 'guys golf' trip, the allure of the area was simply too strong. In the Spring of 2008, we made a family trip to the area. Fate brought us to our home as we rented (through VRBO) the house directly across the street and stared at the For Sale sign on the Three Green Retreat for 3-4 days. Although this property was priced considerably higher than what we originally were seeking, the panoramic views of the golf course were too amazing to pass up. After viewing some properties in the Myrtle Beach area, we returned to CT. After a few phones calls and some serious number crunching, we decided that the quiet, quaint Village of Pinehurst was the right destination for us! Pinehurst is a place where people really enjoy golf. It's more than a game, it is the common thread that connects all of it's residents. The first time you arrive in Pinehurst, you may wonder what all the fuss is about. That feeling lasts for a very short time until you realize that you are now completely immersed into the American Home of Golf and wish that you could stay forever. Location, Size, High Quality Decor/Furnishings and ease of doing business! You simply cannot find a better view of Pinehurst golf. From the backyard, a 10 second walk to the 16th Tee Box. (5) The 50' Plasma in the Main Living Room has a TimeWarner Cable High-Def box + a DVD player. Billiard Room has a 42' HD LCD. Master has a 32' HD LCD. Two of the 'double-twins' have 19' HD LCDs. One double twin has standard TV. Adjoining the Dining Room is an unscreened balcony. Very nice, very large 4-person Jacuzzi Hot Tub privately located on the side of the house. Great house for our family reunion. The house was well suited for a group to relax and enjoy the Pinehurst area. It was well equipped and there were a multitude of items that made our experience there so enjoyable and convenient. The owner was easy to communicate with and the property was a pleasure both inside and out. I hope to go.there again! Great house and hot tub! Thanks, Scott for accommodating our golf party. The house was spacious, provided great entertainment, and allowed us to relax with a great view after our rounds. Highly recommend! Thanks for taking the time to review! I'm so glad you enjoyed your visit. The screened porch overlooking three greens is the place to be after a round of golf! Hope to see you again soon! We had a great time at the Three Green Retreat- loved the pool table in the basement, jacuzzi and the screened-in porch especially! The house is extremely well-equipped as far as kitchen items and towels, etc. goes, and close to everything. Scott was very accessible and quick to respond to any questions we had. There was even plenty of space for a putting contest on the back lawn. Thanks again for a great weekend. Lovely and very comfortable home for our family. Property is in a great location in Pinehurst, close to the village and clubhouse. Ideal house for a golf vacation. Additionally the owner, Scott, was incredibly responsive and helpful when we had questions about the property. Would definitely highly recommend and look forward to going back. House was everything we hoped for and more. Screened porch was a perfect place for reliving the day's round and enjoying some fellowship.House was clean, very well decorated. Owner was helpful and courteous. No doubt we would consider again. Great location, well organized, owner available if any problems or questions. Everything you need is in the house and labeled.